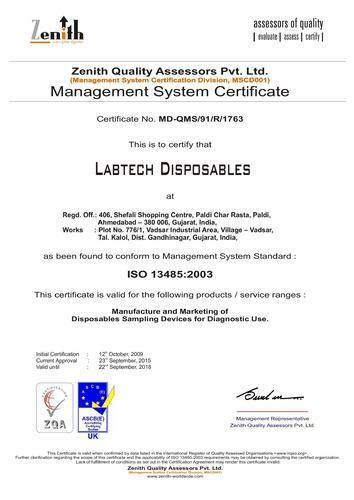 ""The Quality Management System of Labtech Disposables is an ISO 9001:2008 certified for manufacturing and marketing of sample collection devices & vacuumised sample collection devices. 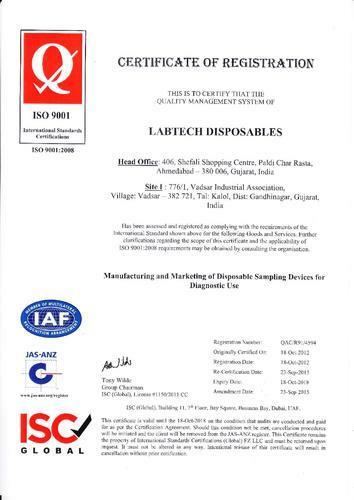 Expiry Date: 18 Oct 2018""
"We are an ISO 13485:2003 certified company for manufacturing and marketing of Disposables Sampling Devices for Diagnostic use. Expiry Date: 22 Sep 2018"